Both the 2012 Subaru Impreza WRX and STI are fun, quick, and tractable in any driving situation; they're large enough for a family, remarkably practical, and their only downsides are the lack of an automatic and lousy fuel economy. While the pedestrian Subaru Impreza sedan and hatchback were thoroughly updated for 2012, the hot-rod Impreza WRX and STI models soldier on with the older and proven body style for another year. Both were restyled last year, with more aggressive styling and substantial suspension and running gear changes, so they're far from outdated. The 2011 wide-body look includes bulging fenders front and rear, a brawny lower-body look, a macho grille and front-end treatment, and four exhaust tips coming out the back. The new wide-fender styling benefits the four-door sedan most, removing its slab-sided economy-car aspect, whereas the five-door hatchback was always sportier looking. Inside, the trim and upholstery, instrument clusters, and even the audio systems were updated to match. Both the WRX and STI are offered in either body style. The differences between the two models, though, belie their similar appearances even though they're only apparent once you get behind the wheel. The 2012 WRX continues with the 265-hp, 2.5-liter horizontally opposed engine, mated to a five-speed manual transmission and Subaru's characteristic all-wheel drive. The STI comes with an even beefier turbocharged flat four, putting out 305 hp, and powering the all-wheel drive through a six-speed manual. Nope, no automatics in the lineup. If you want an automatic, you may not be a suitable WRX or STI buyer. Sorry. The two engines are only 40 hp apart, but they're tuned quite differently. The WRX is more tractable in all-round usage, with smooth torque coming on fully 1000 rpm lower than its big brother. The slightly larger gaps between each of its five gears makes it feel more flexible, docile even, though in the end less aggressive than the STI. The STI is jaw-droppingly quick, but can feel flat at low revs until the driver floors it. Once that happens, the engine begins a rising howl and the car rockets forward in a frenzy of acceleration and engine noise. An SI-Drive controller giving the driver the choice of three different tunes--Intelligent (I), Sport (S), or Sport Sharp (S#)--is limited to the STI model. Along with that level of control come stiffer springs, bushings, and stabilizer bars. A center console switch offers no fewer than six settings to control the lockup behavior of the central differential, and a Super Sport ABS system controls each rear wheel individual to reduce understeer. There's even a "traction" mode in the stability control system, really only meant for track use, that brakes for stability but doesn't cut the throttle at the same time (the system can also be turned off entirely). Larger Brembo performance brakes haul everything down to normal speeds again. The simpler WRX has fewer of these systems, but is still just as fun to drive--and perhaps easier for mere mortals. With experience, drivers know to blip the throttle while braking, drop a gear, and simply accelerate out of the turn with all four wheels pulling you forward. You can even learn how to make the car induce a little four-wheel slide, very neutral and easily controlled. Both the STI and WRX ride surprisingly well, soaking up ruts, potholes, and other bumps with confidence. And despite their power, the cabin is remarkably quiet inside, though Subaru's traditional weak spot--side mirror noise--is present. The racing-style bucket seats hold the driver and front passenger firmly in place, but the fixed headrests project forward at an uncomfortable angle.The STI models get fancier black Alcantara trim and upholstery with red stitching, front and rear, though the rear seats remain the standard-issue item from the regular Impreza. Rear-seat space is remarkable for a compact car, with oceans of headroom even for those with tall torsos. From behind the wheel, the instruments are clear--dominated by the central tachometer--and thankfully are for adults, without boy-racer graphics or odd background lighting. Years ago, the Subaru STI was an economy car with a remarkable engine, all-wheel drive, and handling. Its interior was basic, and it was meant for serious drivers who could put up with some crudeness and a lack of features. Today, WRX buyers would like some of the STI's features, and STI buyers may be eying BMWs or even Porsches in comparison. So Subaru has added options like leather upholstery and a moonroof, satellite radio, and other quasi-luxury features. 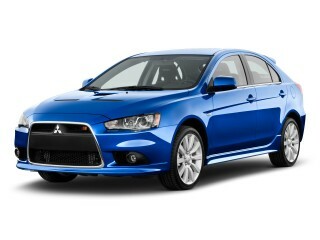 Increasingly, these set it apart from its arch-rival, the Mitsubishi Ralliart and Evolution models. 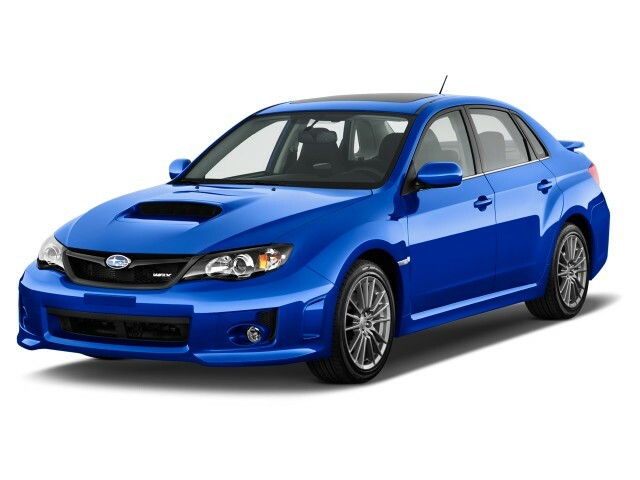 The 2012 Subaru WRX and STI won't be everyone's ideal sedan, but those that get the look will love it. The 2012 Subaru Impreza WRX and STI sedan and hatch carry forward with the changes from 2011 intact, but no significant new tweaks to the look. That's a good thing, though, as the WRX and STI are now divorced from the more pedestrian Impreza, which is all-new for the 2012 model year, making them stand out that much more. And they definitely stand out. With the 2012 WRX continuing to wear the wide-fender look previously reserved for the STI, both models offer a brawny, low-slung, rally-car look. The prominent grille and front-end aerodynamics catch eyes, too, while the rear has it quad-tipped exhaust and, on sedan models of the STI, an available (and large) wing. Hatchback models are no less dramatic, despite their greater practicality. Inside, the WRX and STI are also the same as last year, with the WRX's economical but sporty design enhanced with more sport in STI models through the addition of STI-logo stitching and badges, a unique STI steering wheel, footwell lighting, and Alcantara/leather upholstery. Upgrading either the WRX or STI to Limited status adds leather-trimmed seats and upholstery and a slightly more under-the-radar exterior. The 2012 Subaru WRX and STI are excellent sport sedans, surprisingly good in bad weather, and likely faster than just about anything within a few grand of their sticker prices. While the 2012 Subaru WRX is very quick, the 2012 STI is even quicker. Both share the same 2.5-liter displacement from an archetypal Subaru flat four-cylinder engine, but the STI's extra tuning and Driver Controlled Center Differential (DCCD) extracts the most from the powertrain and the chassis. That's not to say the standard WRX is in any way unenjoyable, however. 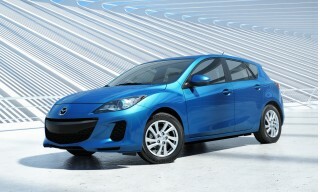 The 265-horsepower output enables quick acceleration in nearly any gear of the five-speed manual transmission. The STI's 305-horsepower rating is even more fun, though, and is paired with a six-speed manual. No automatic transmissions are available, as it should be. The WRX's exhaust note is throaty, but muted; it's a performance version of a normal car. The STI's, on the other hand, is more raw and omnipresent. That can equate to either more enjoyment or more annoyance, depending on the perspective of the occupants. The SI-Drive controller in the STI also ups the performance a notch, with Intelligent, Sport, and Sport Sharp modes available. Each makes throttle response progressively more direct, while the DCCD system allows the driver to bias power rearward when the situation requires. Larger Brembo brakes on the STI enhance stopping power and fade resistance, aided by the Super Sport ABS system, which helps to reduce understeer. The STI's stability control system also includes a "traction" mode, which continues brake use but eliminates throttle cut to improve performance. For the maximum in driver control, the system can be disabled completely. Both the WRX and the STI exhibit very good cornering and transitional performance, though the front-heavy weight distribution and suspension design contribute to the potential for understeer. Subaru has attempted to engineer around that, primarily in the STI, with the addition of unique springs, bushings, stabilizer bars, and ride height, plus a pillow-ball bushing setup at the steering pivot points. Whichever you choose, WRX or STI, there's a lot to love and a little to be wary of with the handling, power, and performance of each. 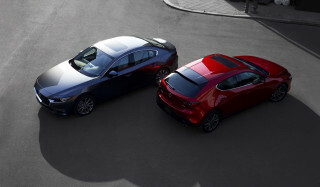 Choosing sedan or hatch is a matter of utility, however, as all models perform very closely to one another. Materials aren't great, but the value you get from the 2012 Subaru WRX and STI make up for it, especially when design, layout, and functionality are very good. In either sedan or hatchback models, the 2012 WRX is technically a five-seater, though larger adults may find reason to complain when stacked three-across in the rear. The hatchback's extra cargo space is handy for luggage or other belongings, especially when traveling at maximum capacity, but both sedan and hatch will find taller drivers preferring the front seat--the rear's leg room is fine for those under six feet, but not for those above. Standard sport-bolstered seats in either WRX or STI models are comfortable and supportive, but the optional Alcantara-surfaced Recaros available in the STI are a great upgrade, enhancing the cabin with a racier look and more comfort, too. Cargo space in general is a reminder that the Impreza the WRX and STI were based on wasn't a large car. The hatchback is slightly shorter than the sedan, and despite the hatch cargo area, doesn't hold an abundant amount of gear. The sedan's trunk isn't perfect, either, due to a sloped, uneven floor. Materials, fit, and finish are generally good, particularly in the price range of the WRX. With the available Limited package, both WRX and STI are upgradable to much more luxurious--though still not quite luxury--accommodations. Both models also handle bumps well, though some will find the STI's ride too harsh. Stiffer springs, lower-profile tires, and a preference for performance over comfort are the contributing factors. Noise isn't bad in either car, with some slight engine noise and wind roar from the side mirrors the most noticeable elements. They lack crash test ratings, but the 2012 WRX and STI are capable, well-handling cars with a fairly comprehensive slate of standards safety equipment, plus the security of all-wheel drive. Along with the departure from the standard Impreza range, the WRX and STI share their structures, including a lighter, more rigid chassis and body panels. Neither the NHTSA (National Highway Traffic Safety Administration) nor the IIHS (Insurance Institute for Highway Safety) has crash-tested the 2012 WRX or STI. Standard safety equipment includes front, side, and side-curtain airbags; electronic stability and traction control; anti-lock brakes with brake-force distribution and brake assist; hill-start assist; and daytime running lamps. And of course, all WRX and STI models get Subaru's standard all-wheel drive for excellent inclement weather ability. The 2012 Subaru WRX and STI are clearly sporty, with options and features to match, but the tuner feel of yesteryear is long gone. Subarus, especially the STI, were once known for being rather basic, tuner-car models based quite obviously on their economy counterparts. Times have changed. The WRX is available in base, Premium, and Limited trims, offering progressive upgrades to upholstery, electronics features, and more. The STI is available in either standard or Limited trim, with its base spec higher than the base WRX's. Some of the available options include leather seats and upholstery; a moonroof; touch-screen navigation with satellite radio; and more. Standard equipment is decent, with Bluetooth, a solid stereo, and auxiliary iPod/USB connectors. Given the WRX's low base price, that may be the most attractive features: how Subaru has packaged so much performance, practicality, and convenience into such a small number. The WRX STI is considerably more expensive, but at the same time, outperforms nearly anything in its price range--while offering a competitive set of standard and optional features. 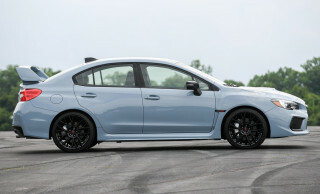 The 2012 Subaru WRX and STI aren't very green, performance sedans or not. While the WRX and STI hit home runs in performance, styling (for some, anyway), and value, they come up a bit short in the gas mileage department. The WRX rates 19/25 mpg city highway, for a combined rating of 21 mpg. The STI does a tick worse, scoring 17/23 mpg from the EPA, for a combined 19 mpg. While they're not particularly green, they are within the normal spectrum for performance sedans--though they're at the lower end of it.